VB: You say "Think globally, act globally." Would you talk about this, as it seems to be at variance with the thinking that we should have to act locally to reduce humanity's negative impact on the environment? When you say, "act globally" you're thinking about businesses, aren't you? Luc de Brabandere: Yes, I may not have written that if I was involved with a sector other than the business world. In The Boston Consulting Group that is exactly the message. We no longer see geographic borders. VB: You point out that the World Wildlife Fund suggests indexes such as Gross National Product should be replaced by sustainability indexes related to a "living planet." What will be needed for businesses to start thinking in these terms, or does that need to be imposed by government? Luc de Brabandere: That is a very interesting question. I wrote that observation four years ago. Recently Joseph Stiglitz, Nobel Prize winner and regular columnist in the New York Times, was in Paris meeting with Nicolas Sarkozy, the President of France. He subsequently wrote a proposition exactly in that direction. The way we measure things is no longer appropriate. If an oil tanker sinks in the ocean it is excellent for the Gross National Product, which measures the value of all the lost oil as well as the cleanup efforts. This demonstrates that the GNP, which increases with environmental accidents, is not a good measure. Ten years ago the World Wildlife Fund was talking about this then new idea, and now it is starting to be disseminated. I was surprised to see President Sarkozy talking about it on television last Sunday. He said we don't have to stick with the old, obsolete ways of managing the economy. We need a new way of measuring countries' economic outputs, a new way to assess progress. The World Wildlife Fund was really visionary a decade ago with this idea. VB: Would this also change the definition of a recession? Luc de Brabandere: GNP is not enough of an indicator, because the recession today is made up of different things. One of the reasons we made some bad decisions leading to the recession is because we have bad indicators, or better put they were wrong indicators. For example, pollution should not be perceived as a cost but rather as a debt. Today, it's not even a cost – it's nothing. I can imagine big changes in the accounting systems to address this issue but that's for another discussion. VB: You said pollution should be perceived as a "debt." Luc de Brabandere: As a debt, exactly, a debt to the next generation. At least in Europe, ecology and environment are often not managed well or at all. People think you can manage the problem with new taxes. I'm not in favor of new taxes, because the tax system relies on a country's accounting and, if the accounting is not appropriate, then a tax could, and likely would, be completely useless. The effort should be on fixing our approach to accounting. Let's start to measure things the way they are. I think there's only one country in the world that's run like a company – Norway. Norway has a balance sheet. As far as I know, all other countries in the world run themselves without balance sheets – only with costs and losses. It could be a beautiful project to figure out how to run all countries like companies – to at least to have a balance sheet as a managing tool. VB: Is it your perception that decisions in Norway are different because of this balance sheet approach? Luc de Brabandere: Yes, I'm absolutely sure of it. When you look at how well Norway manages energy resources, the country's oil, it's because they have a better accounting system. I have a Norwegian associate who I often talk to, and he explained in detail why it makes such a difference. Norwegians have a one hundred-year perspective in their way of thinking and managing the country's economy. VB: Because negative and positive environmental impacts are included on a national balance sheet it's a longer-term perspective. Luc de Brabandere: Exactly, profit and loss is like a picture. You look at what revenues are coming in, the taxes, and what goes out, all of the expenses. By taking this approach you don't have any projection of the future other than cumulative debt from past losses. In Europe we face a huge problem with retirement, because today retired people receive pension money earned by young people. My taxes contribute toward paying the elderly. This works as long as it works, but it is a bit tricky it's like Bernard L. Madoff Investment Securities in the U.S. – a pyramid scheme. VB: It's like a pyramid scheme because as you increasingly have proportionately fewer younger people earning a living, the pension system can't afford those on pensions. Luc de Brabandere: Yes, and in Europe this is definitely true. When the pension system was started 60 years ago there were likely about 3 wage earners for every person receiving a pension, I don't know. Today, in many countries it's more like 1½ young for every old person, meaning they have to pay twice as much to keep the system alive. VB: You say that "All Rights Reserved" at the beginning of books will soon be replaced by "Certain Rights Reserved." If you had taken that approach with The Forgotten Half of Change what rights might you have relinquished? Luc de Brabandere: Personally, I don't need any copyright protection. I have so many ideas all the time everybody can have them for free! But this is my personal view. There was a French author, André Malraux, who said, "I have so many ideas people can take them without damaging myself." For me, I don't believe in owning copyright over my books anymore. I'm not sure the publisher would agree with me! My joy is in talking to you at IdeaConnection and sharing ideas, not in having a dollar because I sold a book. This is very clear in my mind. My livelihood is as a consultant. The money I make from books is not much. It's a huge problem for authors who are only earning a living by writing, but that's not my case. VB: You say, "You don't see the world like it is; you see the world like you are." Would you talk about this? Luc de Brabandere: I'm a Belgian, and I grew up in the Graeco-Roman French school system. They probably also have this kind of idea in other civilizations. For example, I would be surprised if it doesn't exist in China, thought I don't know a lot about China. To me this sentence is a summary of Immanuel Kant, who in the history of philosophy was the Copernican. Before Kant people tended to believe there was an objective way to see objects – that it was possible to agree on what we see and to understand objectively what's happening. Kant is famous because he postulated this was not so, and in the end everybody agreed. He argued that you partly build the way you see things. Of course you can't summarize 3000 pages of his writings in one sentence. Starting around 200 years ago, because he published his 800-page book Critique of Pure Reason, people started to integrate the fact that there are subjective pieces in any kind of thinking process. You can't get rid of them. Merely accepting this opened many doors. It made Sigmund Freud, Palo Alto School, and a lot of other things possible. I used another quote in my book, this time from Francis Bacon: "You have to obey the forces you want to command." If you want to command the forces of thinking, you have to obey the laws of thinking. That quote distilled from Kant is a law of thinking. I want to propose one example that illustrates this. It's not rational to be 100% rational. It's not even possible. For example, imagine you have to buy a new car. What would be 100% rational? You would need a list of all available cars, and feedback from at least 120 users of each car make and model. Nobody does that. No one is 100% rational, whether going to a restaurant, buying a new tie, going on a holiday, or picking a school for their children. The interesting question is "Which non-rational pieces need to be included in a decision making process?" This takes us back to Kant and what could be called a cognitive bias, meaning you use shortcuts. If you want to buy a car, you will eventually make a shortcut somewhere – a shortcut you may not necessarily be aware of. Maybe it's partly unconscious, and that's why this concept is so important. It opened a new era in thinking. There are many books today in the U.S. and elsewhere about this thinking process and about the cognitive bias. All those books, including Malcolm Gladwell's Blink, in the end are children of Kant. VB: You say, disregarding or treating as irrelevant the weak signals is how "…we miss opportunities and make mistakes." Is investigating these weak signals an important aspect of change and enabling us to "shift to the next good idea," to be creative? Luc de Brabandere: It is a necessity, but it's not enough. Look at today's CEO's. One CEO considers a certain weak signal as important while others completely disregard it. It brings us back to the quote in your previous question. The weak signal is not easy to detect, but once detected the question becomes what will be the perception? You might see something weak and tell your friends, "This is not important." VB: Yes, but it may actually be an indication of the beginning of an important trend. Luc de Brabandere: Maybe, but it's not objective. It's not because it is a weak signal that it's necessarily a big thing. Sometimes a weak signal is just a weak signal. The same weak signal will not generate the same reaction in two different people, which means that part of the reaction is subjective – and thus not completely rational. There are two steps. First, accepting that there are weak signals. Second, checking how we react to them. VB: "The brain is a two-stroke engine. The first brings you from good old to new; the second one from new to good new." Do you have suggestions for how we can cultivate both strokes – imagination and judgment – so we can become better thinkers and be more creative? Luc de Brabandere: Get a better driver for the car! Obey the laws of thinking! Here is another law: we have two different brains, with two different sets of characteristics, and it is impossible to run the two brains at the same time. Probably my most frequent message is, "Don't use your two brains at the same time." You need good judgment and good imagination, but there is a third point. You should not use them at the same time. VB: And you need to learn to make certain you are not trying to use them at the same time? Luc de Brabandere: Exactly. One of the ways to do this is to not be alone. I've observed many situations in which two people, two groups within teams, or two companies working together will each specialize in one of the two strokes of the brain. One party focuses on contributing imagination and the other the judgments. "You doubt and I decide." I believe in teams of two because the brain is a two-stroke engine. Examples are Hewlett and Packard, and Rolls and Royce. VB: When there are participants playing each part it ensures maximum benefit from the two types of thinking. Luc de Brabandere: Yes. Some people are so good at thinking they can probably do both types. Good examples would be Thomas Edison and Steve Jobs, but most of us are not Steve Jobs. As I said, one solution is to share decision making with somebody else. I know what I can and can't do, so I always try to work with other people to share in making decisions. Even people with whom I don't agree, because I know I can't decide by myself. Some people make big mistakes because they are good right-brain thinkers, and believe they can also suddenly become good at left-brain thought processes. A famous exception was Einstein, who was proposed to be President of Israel. He said, "No." His reason was that just because he was a genius at using the right side of his brain it did not mean he could suddenly become a genius of the left side, which is what is normally required in a president of a country and certainly for Israel at the time. VB: Einstein knew he could not use both strokes of the engine in this brain equally! Luc de Brabandere: He was a wise man. Luc de Brabandere: It's an oxymoron. If it's disorder, it's not organized. If it's organized, it's not disorder. I mean that you have to move ahead of this little paradox. A lot of people believe that creativity is about freedom. Sometimes I am happy to show it is exactly the opposite. Creativity is about rules. If you look at the symphonies of great composers, Marcus Tullius Cicero's speeches, or beautiful temples in Greece they are completely organized by rules. Creativity is sometimes the choice, or good use, of a set of constraints. Creativity goes along with constraints. For example, if you have a lot money to make a movie, you will probably be less creative than somebody who has less money. VB: You have to think how to accomplish the goal despite experiencing scarcity. Luc de Brabandere: Yes. That's what I mean by "organized disorder." You have to exercise freedom of thinking within a pattern, a shape, or a set of rules. Music, for example, is nearly like mathematics. VB: Imagination or the "birth of a new idea, the process we call thought" is composed of stages: "Astonishment + Questioning = New Ideas." How can we ensure we ask the right questions or, in your words, "raise questions about the question?" Luc de Brabandere: You are never sure. If you put the same question in a different way, if you raise a question about the question, the chances are higher that you will succeed. After running probably more than a thousand brainstorms I now realize that some questions are better than others. A brainstorm always starts with a question – how, what, why, when, and so on. Some questions are much better than others in order to start, feed, and spark a good brainstorm. Sometimes reformulating the question is a better investment than the brainstorm itself. If you focus only on astonishment, or only on questions, you can learn a lot and stimulate thinking. If you put everything together, maybe you will stimulate the imagination process. I am a mathematician. I remember that for some problems if you find the right way to come up with a question, you almost immediately reach the solution. A large number of brainteasers do the same thing. If you put the question in a particular way it's easy to generate a solution. If you put the same question another way, it's much more difficult. It's the same with creativity. VB: Astonishment and questioning tend to jolt the brain by a surprise, don't they? Luc de Brabandere: Exactly, but let's separate astonishment and questioning. Part of my job when working with clients is to show them the different steps. Astonishment deserves at least an hour of thinking time, subsequently you can work on questioning, and then comes the brainstorm. I encourage people to do it in sequential steps – not to do everything at the same time. VB: In The Forgotten Half of Change you advise that imagination can be fostered by adding a fourth stage to the formula – creativity techniques or methods. What did you have in mind when you wrote this? Luc de Brabandere: Creativity is well known in the business community. People like Edward De Bono and others have promoted creativity techniques such as the six hats, brainteasers, metaphors, mind mapping, and many other tools. I agree they can help organize and increase the efficiency of the brainstorm. But I came to the conclusion that creativity techniques are not the most important. Consider, for example, the simple question why didn't Sony launch the iPod? Twenty years ago Sony had the "Walkman," a little box with two wires and a device in the ears. So how is it possible they missed the iPod? It had nothing to do with creativity techniques. They could have run millions of organized brainstorms within Sony and I am absolutely sure it would have been completely useless. The problem at Sony was different. The reason they didn't launch the iPod had nothing to do with brainstorms and creativity techniques. It's more a question of why the ideas that could have led to an iPod-like device at Sony did not get a chance to grow. VB: Probably the decision by Sony to go with Beta rather than the VHS standard for videocassette recorders wasn't because of a lack of creativity. It was likely a business decision to try and dominate the world market, which is a different thing, isn't it? Luc de Brabandere: Probably you are right. Certainly the creative ideas for both versions would have existed somewhere within Sony. You often see this syndrome. There are many examples of a creative idea existing in an organization and not being developed, and then someone else brings the same idea successfully to the marketplace. Not long ago I was talking with a member of the executive committee of a credit card company and he told me, "It's too bad we didn't invent PayPal, we had projects like PayPal for Internet payments but didn't pursue them." If you look at the Internet today, at the 10 to 20 major players like Google, YouTube, and FaceBook, none of them were invented in large corporations. How was it possible for CNN or NBC to have missed the YouTube idea? They had the technology and the creative talent, so the idea must have been somewhere in those organizations. I am absolutely sure that somebody at CNN had an idea like YouTube. So the problem is not with brainstorming, nor with the use of creativity techniques. The challenge is not to "think out of the box" because that is not the appropriate way to talk about creativity. The challenge is what I call "Thinking in New Boxes." The real challenge is to build new boxes – new perceptions or paradigms where existing ideas suddenly make sense. VB: You say, "Today you have to build earthquake-proof companies…" Is that possible or even desirable given the pace of change of technology, consumer expectations, and the New Economy? Luc de Brabandere: Some companies are doing that because they are robust and able to deal with uncertainty. Recall our discussion about cybernetics and feedback. They are what I call "earthquake-proof companies." Some companies are better at being earthquake-proof, and one way is to build scenarios. Scenarios can be developed and distributed throughout a company in order to share their open mindedness, to tell everybody that the future is open. I promote this thought in my consulting work, and now more and more companies are doing scenarios. They are constantly thinking about different possible futures. When making any decision you should consider different futures. What if this and what if that? VB: Don't try to predict accurately what the future will be but identify a number of different possibilities, different scenarios. Luc de Brabandere: Voilà, because you will not succeed in predicting. Nobody can predict anymore. To me an earthquake is uncertainty. You don't know when and how severe it will be, but you can be better prepared. One of the ways is scenario thinking, plus working to have better feedback in the system. VB: And it helps us to cope better with change and the unknown future. Luc de Brabandere: If it's unknown, the great danger is to not do anything. Some may say, "I don't know what's going to happen so I'm not going to do anything." That approach isn't allowed anymore. Indeed, because you don't know what's going to happen, you have to act. You have to be prepared. VB: What can we learn from your observation, "What is fashion if it isn't an invitation to look the same by making yourself different in the same way?" Luc de Brabandere: I believe Maslow was right with his hierarchy of needs. You want to belong to a community. As soon as you belong to a community, you want to be different. You want to belong to the community in a different way, and that to me is fashion. It goes with uncertainty and irrationality. Since reality is more and more the same everywhere, fashion will play a greater role in the future. VB: You talk about the capacity for creativity within constraint, and how a new idea doesn't necessarily need new resources. Are you seeing a flurry of creative, new ideas being pursued by businesses and governments during the current difficult economic climate? Luc de Brabandere: Yes, as I said earlier you have to change twice. I hear a lot of ideas that have never been presented before. Like President Sarkozy with Stiglitz talking about the new way of measuring things. Today there is definitely a flow of new ideas but that is not enough. You have to implement the new ideas in order to innovate; otherwise it's going to be just creativity. Take Leonardo De Vinci, who I believe was the most creative person ever – very little happened after him in terms of implementing his ideas. And it has been four centuries! In companies people are now forced to imagine new ways to do everything, this includes controlling finances, dealing with major cash flow problems, developing their technologies, fighting climate change, and almost everything else. Today there are more ideas in the newspapers, than in the past, about how to solve these large-scale problems, but it may not be enough to lead to the next big innovation breakthrough. VB: The European Commission has established the Competitiveness and Innovation Framework Programme aimed at supporting innovation activities and the competitiveness of companies. Is it having a noticeable effect in Europe? Luc de Brabandere: As far as I can see, the answer is "No." I am a convinced European Union person, but disappointed by the effectiveness of the European Commission. I think business is contributing more to the building of Europe than the Commission. Most French people don't feel they are Europeans. This feeling is even stronger in Belgium, because it is a small country. There is too much fighting by the various countries for their own privileges. Everyday there are problems with France and Germany and the European Commission. VB: I guess it's what you talked about earlier regarding the merger of companies. Luc de Brabandere: Exactly. The European situation is exactly the same as two merging companies. There is a big forgotten half of change. VB: Are the entrepreneurs and business leaders you deal with in France and other parts of Europe aware of the critical importance of creativity and innovation for their future survival and profitability? And are they taking steps to make it part of their organizations' culture? Luc de Brabandere: The answer is "yes" for those we work with. Perhaps less so with others because they don't work with The Boston Consulting Group! If we are providing strategy planning or other services to a business, it's because they have an intuition, need or desire to be innovative. If they don't believe in creativity, they won't contact us or use The Boston Consulting Group. VB: The companies you are working with are taking steps to develop strategies. Are they taking other steps, like actually implementing innovation and driving an innovation culture? Luc de Brabandere: Yes, but we are not dealing with implementation projects. If companies have to implement large new computer systems, for example, they have other consultants who specialize in implementing new IT. We don't do that; our specialty is strategy. We help companies make decisions and develop scenarios. VB: What are some of the things the U.S. and other countries could learn from Europeans about achieving creativity and innovation? Luc de Brabandere: You always learn from difference; other countries can learn from us exactly the way we learn from them. But today I don't see symmetry between the U.S. and Europe. I used this analogy before but I think the wind is blowing from the Gulf Stream and flowing almost exclusively one-way from the U.S. to Europe. Probably we learn more from America. VB: Why do you think that is the case? Is it economic might? Political or military power? What is the reason for that? Luc de Brabandere: Ah la la. There are a lot of reasons, but probably the main one is that in Europe we are divided too much. We don't have strong leadership. I don't see Europe as a leader, but rather it's a community of smaller leaders. It's not what we need. Plus we have multiple languages, which could be seen as a positive force, but to me it's more of a problem. And then there is our history. We've had the two World Wars on our soil not that long ago, and it takes time to heal old wounds. It takes time, but we are heading in the right direction. When I see our youth today I become very optimistic about Europe. They travel a great deal, study and sometimes work abroad, speak different languages, and cross border marry. VB: I was listening to an interview with a young woman from Poland this morning, and she was saying that people in Poland need to quit looking back so much at their history and look to the future. Does that relate to what you are saying, in Europe there is a lot of tradition and history that is a deterrent rather than solely a benefit? Luc de Brabandere: Yes, we should take the positives of our traditions and learn to forget the bad news of the past. Poland was still communist 20 years ago, but that's not the case here in Belgium. If you look at Europe 200 years ago it was incredible. Everything was here: Darwin, Freud, Dunn, and so many other innovators were European. But today Europe has not survived its success. VB: Why do you think that is? Luc de Brabandere: Because it was incredibly successful. Europe had so much: science, business, money, culture, wealth, creativity and innovation. Probably in our success we made a little mistake – we forgot to look outside. VB: It still has wonderful culture. Luc de Brabandere: Yes, and I am an optimist. We will rebound. Today it is just not that easy. VB: What interesting projects are you currently working on? Luc de Brabandere: We don't talk about our clients; so I won't name any but I'm working on big change problems, like post offices, train systems, and banking systems. They are all facing new paradigms. The bank of the future, the train system of the future, and retail with e-commerce, they all have to change. One of the strengths of The Boston Consulting Group is that we work with everybody. We do not specialize in any one industry, fashion, or financial area. We specialize in change. VB: Big change problems relate to technology, environmental concerns, growing population, an aging population, world security, peace among nations and a lot of other large scale issues. This provides a tremendous opportunity for creativity and innovation. Is that why big change problems are so intriguing? Luc de Brabandere: Probably. When I was born 61 years ago there were 2.5 billion people on the planet. Today, there are 6.8 billion people. This rate of increase cannot last. And I haven't even talked about climate change and the incredible impacts it will have on nations, including massive displacements of peoples. It means this 21st Century is a critical point in the history of mankind. Now it is up to us to make the right decisions. VB: And we can't just say "We'll let our grandchildren solve it." That'll be too late. Luc de Brabandere: Most probably. Maybe not my children, but my grandchildren will know an Earth without oil. Are we taking this challenge into account? Shouldn't we start today to think about that and other important problems? We haven't even mentioned world hunger, poverty, health issues, and disparities in standards of living throughout the world? I think it is, "Yes, we must." VB: It has been said you are a "self-described corporate philosopher." What does this mean? Luc de Brabandere: It means that there is room for people like me. A philosopher has nothing to sell. I have nothing to sell, but there is a lot of demand! If there were no need for what I am doing, I wouldn't exist as a philosopher. Corporations need to rediscover the power of thinking. Creativity was my job for 20 years, but now I take some distance from this area of practice. I try to help people to think, clarify their ideas, organize their ideas, give good definitions, clearly articulate their problems, and make sure they avoid confusion. I know there's a market for what I offer because I see my mail. But it's impossible to market philosophy! What I offer has to provide benefits in strategy, and decision-making. It's as simple as that. VB: As a philosopher you help people think clearly. Luc de Brabandere: Voilà! Probably the best definition is to help them think clearly, to clarify. VB: You are a very enthusiastic person. Do you also have a lot of fun? Luc de Brabandere: Oh, yes! I just finished a book on jokes, the philosophy of jokes. I think humor is the best fuel for my job. When there is a meeting and nobody is laughing, I am very disappointed and I think it is not a very good meeting. VB: What is there about laughter and humor that makes it a good meeting or helps with creativity? Is it what stimulates imagination, the right side of the brain? Luc de Brabandere: First you have to make a distinction between humor and irony. Sometimes you laugh about irony, but irony is a weapon. It's used to take power, to kill the opposite. I don't use irony and I recommend only using humor. Humor brings people together, and when there is humor it means that people have made their perception flexible. What is a joke? It's when somebody tells a story, suddenly you understand it differently, and then you laugh. It means that in your head there has been a change of perception, which is exactly the definition of creativity. So humor is an indicator; when there's humor there is room for creativity. VB: Are you, like me, a fan of Hercule Poirot, the famous Belgian Agatha Christie murder mystery character? Luc de Brabandere: Hercule Poirot? Oh yes, it was Peter Ustinoff who had the role in many of the movies. I think you are right to think of him because the eureka of Hercule Poirot has exactly the same mechanics as the eureka of a creative person. Those processes belong to the same environment of creativity. VB: Is there anything else I should have asked you? Luc de Brabandere: A billion things! I think it's enough. I really enjoyed our conversation. It's a "non finito" world. When you only have a hammer everything looks like a nail. Individuals, teams, organizations and companies need to "be the hammer of change – not the nail!" Change is not an option so being a hammer is also not an option if we wish to succeed. There are hundreds of laws of perception. You don't see the world like it is; you see the world like you are. We think only with forms: stereotypes, patterns, and paradigms. A lot of bad decisions are not due to a lack of information, but rather to the way our minds work. The world is changing, not the way we think. There is power in astonishment at the presence of something and the absence of something. Everything is a problem because nothing is a solution forever. 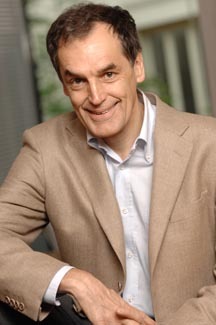 Luc de Brabandere is Senior Partner & Managing Director in the Paris Office of The Boston Consulting Group. He is a member of the firm's Strategy practice, and specializes in helping firms develop their strategies and scenarios. He is also a foremost expert on applying creativity to business. A wide range of audiences attends his strategic seminars. Since the early 1980's de Bradandere has been developing his philosophical approach to management and technologies. Prior to joining The Boston Consulting Group he was a computer scientist and information service manager at Generale de Banque, the Chairman of The National Geographic Institute, and General Manager of the Brussels Stock Exchange. De Brabandere has a Master's degree in civil engineering in applied mathematics (1971) and a Ph.D. in Philosophy (2003) from the Catholic University of Louvain. Luc de Brabandere has authored or co-authored many books, including The Forgotten Half of Change: Achieving Greater Creativity Through Changes in Perception (2005), which has been translated into Spanish, Portugese, Russian, Japanese, Chinese and Thai. Others include La Valeur Des IDÉES: De la créativité à la stratégie en enterprise (2007), Le Plaisir Des IDÉES: Libérer, gérer et entraîner la créativité au sein des organizations (2002), Le Management Des IDÉES: De la créativité à l'innovation (2002), Le Sens Des IDÉES: Pourquoi la créativité? (2004), Les Infoducs: Un Nouveau Mot, Un Nouveau Monde (1985), PENSÉE MAGIQUE, PENSÉE LOGIQUE: Petite philosophie de la créativité (2008), Petite Philosophie De Nos Erreurs Quotidiennes: Comment nous trompons-nous? (2009), Petite Philosophie Des Histories DRÔLES: Eyrolles (2007), Balade Dans Le Jardin Des Grands Philosophies: ÉDITIONS MOLS (2009), ESPÈCE DE TROCHOÏDE! : 50 idées mathématiques expliquées au profane (2006), Machiavel, Erasme Et More: Trois philosophes pour les managers d'aujourd'hui (2000), Calculus: Les machines de calcul non électriques (1994), IL ÉTAIT UNE FOIS LA MULTIPLICATION: Ou (re)découvrir le plaisir des mathématiques (1992), and LE LATÉROSCOPE. SYSTÈMES ET CRÉATIVITÉ: Préface de Joël de Rosnay La Renaissance du Livre (1990).